This study runs counter to the conventional wisdom and conventional practice in Japan, where it is routinely assumed children of divorce and separation are better off with the noncustodial parent completely removed from their lives. I am the cofounder of Children First (childrenfirst.jp), an NPO that focuses on children’s issues. Every three minutes another child loses all contact with one of their parents after divorce. Every seven minutes another child is a victim of school bullying. Every 12 minutes another case of child abuse is reported to protective services. Every week at least one child dies as the result of abuse. Children First is working to overcome these issues and other problems affecting children. But we can’t do it alone. We need the help of Diet members and policymakers to change things so Japan is a better place for children. Most people are aware of bullying and abuse. These two issues make the headlines often. But a problem I and many other parents find more alarming is that every three minutes a child loses contact with one parent due to divorce. On March 11, more than 16,000 people died; about another 5,000 are still missing. Hundreds if not thousands of children lost at least one parent on that day. Since March 11, more than 82,000 children have lost contact with one parent due to divorce. This is a silent tragedy that is spreading like a cancer throughout Japan. It is preventing children from reaching their full potential. It is destroying families and family values. It leaves children confused about the future and it reduces their chances of having a normal life. It leaves some parents and children to deal with unimaginable grief. It is a silent tsunami that many people don’t know about. The family courts and the Japanese legal system are allowing this tragedy to continue. In 2006 the Supreme Court made a DVD titled “What Couples with Children Must Think About When They Live Apart.” Surprisingly, the family courts don’t show this video to parents. Quite the opposite: They hide the existence of this DVD and family court judges make rulings that go directly against the message contained in the DVD — that children need both parents to be happy. Some family court lawyers are unaware that this video exists. Now, the average parent gets four hours of visitation per month with his/her child. This is hardly enough time to form a bond or make a difference in a child’s life. Some parents use parental alienation to destroy the relationship the child once had with the noncustodial parent. According to the United Nations Convention on the Rights of the Child (UNCRC), children are entitled to have a relationship with both parents. If for some reason the parent and child are separated, the state (Japan) must re-establish contact with the left-behind parent. Of course, this never happens. So, the family court has failed twice. They don’t follow the advice of the Supreme Court DVD and they ignore the UNCRC, which is equivalent to a law. I think it is time to review the rulings of judges throughout Japan and get rid of the ones who make bad rulings. I have been told by lawyers that judges sometimes don’t even look at the case files and are unprepared for what takes place in court. Bad judges need to be removed from the bench. Mr. Prime Minister, I am asking you to take the necessary steps to remove bad judges as well as pass laws that guarantee children will have a long and meaningful relationship with both parents. Furthermore, I would also like you to pass laws that do a better job of protecting children from abuse and bullying, as well as implement better policies for reporting abuse and bullying. Teachers and bureaucrats are the key to eliminating abuse and bullying. I hope you give them the necessary tools to make a difference. Currently, I have an active court case but that should soon change. On Sept. 13, the judge will make a ruling on my case regarding divorce and custody. If history is any indication, there is a 100-percent chance that I will lose. I plan to ride my bicycle from Kumamoto, where my court case is, to the Supreme Court in Tokyo. I will demand that family law be changed. I will stop at prefectural offices along the way and garner support from governors. I have taken eight weeks off of work for this cause. You can follow my progress on the Children First Japan Facebook Page (www.facebook.com/pages/Children-First-Japan/115396388532379) or the Joint Custody in Japan Facebook Page (www.facebook.com/oyako) and you can also find more information about my trip on my blog Children First Japan (kwbrow2.wordpress.com). It’s been over a year since I last wrote to The Japan Times. I told the story of a “A little girl lost in Japan” (Hotline to Nagatacho, March 30, 2010). That “little girl” is still lost to her father and her paternal family in California. Today I sat in my studio painting a picture of my darling Mine. I used the picture her father took of her the last time he saw her a year ago in March. The sad-eyed little girl looked back at me from the picture. Her hurt expression brought tears to her grandma’s eyes. As I drew her little features it was so obvious she had my eyes — big, dark brown eyes. She had her Aunt Laura’s lips and her father’s hairline with it’s widow’s peak. She is us! Before she left for that last visit, she had confided in him that she was forced by Mommy to tell him she had no more time to see him once a month for two hours. She is and always be my darling Mine. She is the hole in my heart. How I long to just once hold her as grandmas do and tell her how much I love her and treasure her. I hear Japan will soon sign the Hague treaty to allow no more kidnappings of mixed-race children from their non-Japanese custodial parent. This is good news. However, it means little to our family or Mine’s father. Her Japanese mother and grandmother have sheltered her away from her father and his family for almost 10 years off and on. I am a child psychologist as well as an artist. I can only imagine all the damage done to my darling little Mine and other children like her. How can she grow into a confident woman when she has had to deny half of her heritage for all but two years of her life? Both her mother and her grandmother have a history of spewing hatred of her paternal family who love and treasure such a wonderful child. Japan has many problems, as does any country in this time of turmoil. Why then does the government allow such atrocities against children to continue? Children have the innate right to be loved and treasured by both their parents without reproach. Research has demonstrated that children who have healthy relationships with both parents develop into well-balanced and successful adults. The norm of the Japanese court system is to only grant custody to the Japanese mother, leaving the father out in the cold. Even if the mother has a history of mental illness or other serious issues, she is awarded custody — forget about what’s best for the child. In Japan the government’s failure to recognize children need both parents to grow into stable adults will only succeed in producing damaged adults. 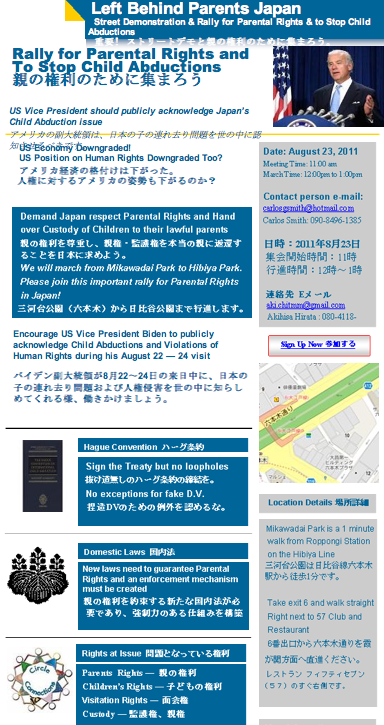 BACHome (Bring Abducted Children Home) parents and members sent Vice President Joseph R. Biden, Jr., a letter concerning his upcoming meeting with the Japanese Prime Minister. 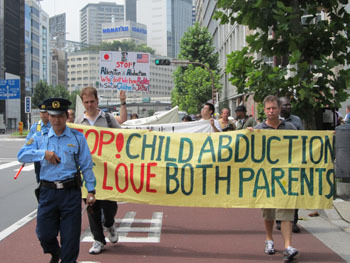 BACHome is urging the Vice President to publicly address the ongoing issue of children taken from the United States and abducted to Japan. At the time of BACHome’s letter to Vice President Biden, there were 123 known active cases, involving 173 American children who remain detained in Japan by their abducting parent. BACHome (Bring Abducted Children Home) parents and members sent Vice President Joseph R. Biden, Jr., a letter concerning his upcoming meeting with Japanese Prime Minister Naoto Kan. BACHome is urging the Vice President to publicly address the ongoing issue of children taken from the United States and abducted to Japan. BACHome is also encouraging the Vice President to discuss this heartbreaking and grave issue while in his private meeting with the Prime Minister. Currently the U.S. Department of State has been successful in resolving zero cases. At the time of BACHome’s letter to Vice President Biden, there were 123 known active cases, involving 173 American children who remain detained in Japan by their abducting parent. Neither diplomatic or political means nor the Japanese courts have been able to come to a positive resolution concerning not just American citizens abducted to Japan, but from other countries as well.